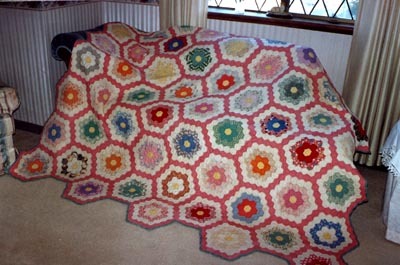 Hexagon quilt in pattern known as 'Grandmother's flower garden'. Hexagons of prints and plains with yellow centre to each flower, and plain pink outlines. It is hand pieced and hand quilted. Padding is cotton, backing is cream cotton. 2200 x 2000 mm. Quilt was bought from 'The Quilt Cupboard' at a craft show, in 2000. Quilt may be from Pennsylvania.
" Reversible patchwork quilt of woollen suiting in grey, blue, navy, maroon and brown. The fabrics appear to be new tailor's sample pieces (the sizing is still present on the fabric, signifying it has never been washed). The patches are rectangular and vary in size. Both sides have different designs. The front of the quilt has 4 rows of 12 vertical rectangles then below this are 4 rows of 7 horizontal rectangles followed below by 4 rows of 11 vertical rectangles. The reverse of the quilt has a section at the top and bottom composed of 5 rows of 9 horizontal rectangles. The central area is made up of a centre section of 6 rows of 5 vertical rectangles; flanked on either side by a column of 10 horizontal rectangles and two columns of 8 smaller vertical rectangles. The patchwork layers are joined at the edges with machine stitching. 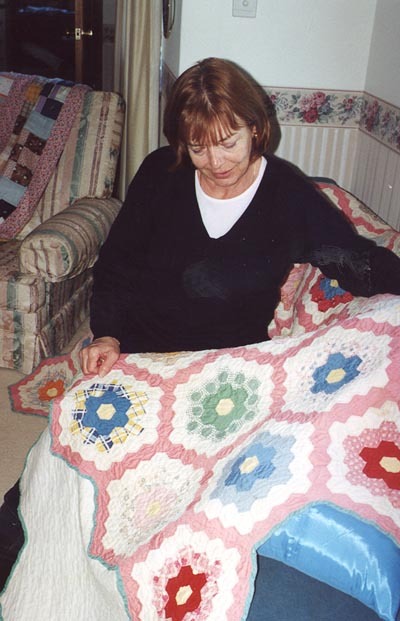 The patchwork layers and padding are machine quilted on the front down 2 vertical lines following joins in the patchwork; therefore not being totally straight. The lines are more noticeable on the reverse as the 2 sides do not match. The front face is displayed at the NGA. The top of this quilt is 6 x 5 alternating squares and rectangles of check woollen material in 12 or more colour ways. Herringbone stitch in yellow stranded cotton is worked along each join and border.The border is plain grey wool. There is no padding and the backing is light blue crepe. Patchwork quilt with alternate squares of green and fawn cotton headcloth. Various Australian wild flowers are embroidered in coloured threads in the green squares. In the fawn squares there is a stylised flower and leaf pattern outlined in embroidery. The border, front and back is green headcloth. The backing is printed cotton with a floral design. There is some padding. Quilt of alternate green and fawn squares (100mm) in knitted fabric, originally swatches of sample fabrics. Padding is a piece of old blanket. 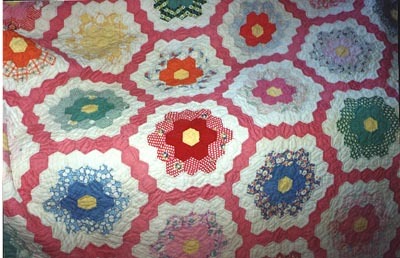 Backing is fawn flannelette, and the quilt is finished with a flannelette ruffle.